One of Birmingham's grocers back in the days when the local guys kept the A&Ps and the Krogers at bay and dominated the food business. The Hill's name as a standalone entity came to an end in the '60s when it was absorbed by a growing chain based out of Jacksonville, Fla. called Winn-Dixie. The transition to the now-familiar name took a number of years. For much of the mid to late '60s, the Hill's logo and the famous W-D "checkmark" insignia were used side by side (see picture below). My grandfather sometimes referred to this store as "Winn-Dixie Hill's", long after the Hill's name disappeared from Birmingham signs. My own recollection of Hill's is limited to the store at the corner of US-31 and Oxmoor Road in Homewood, my grandmother's favorite grocery haunt until her death in 2003. I FAINTLY remember the script logo seen below on the sign out front, although by the early '70s, the building was rebranded a Winn-Dixie. But the "flowerpot" sign remained well into the '80s, only now containing the Winn-Dixie logo. Today, it's a Piggly-Wiggly, but as recently as the mid '90s, a curious remnant of Hill's legacy was still visible: a round sign atop a chimney-like protrusion out front (a common architectural touch for supermarkets of the day) baring an old Hill's slogan: QUALITY AND SERVICE FIRST. Among my many regrets is not taking a picture of that when I had the chance, because about 10 years ago, P-W completely rehabilitated the building's facade, and now that brick protrusion sports the Piggly-Wiggly pig logo. 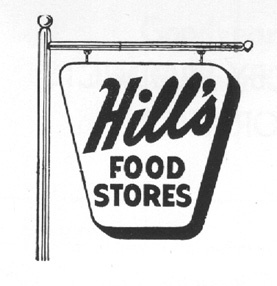 Script logo and flowerpot-shaped sign used by Hill's in the pre-Winn-Dixie days. Text from a Hill's advert in the 1962 yearbook of Birmingham-Southern College. Obviously, men were not allowed to do any shopping at Hill's, because - as you can clearly see above - they only "served the housewives of Alabama." Hill's Food Store at Eastwood Mall, seen in this March 1965 picture. And on that banner just inside the big windows..... ....was a certain round icon very familiar to Winn-Dixie shoppers right here in the 21st century. Hill's meats were already being called "W-D Brand." Hill's Food Store in Hueytown, circa late 1950s. Winn-Dixie stores used to sport a round logo ... and here's one used for a short time in the '60s during the brand transition. The smaller Winn-Dixie stores once carried the Kwik-Chek name. The classic Winn-Dixie insignia. Along the top read "Save with", and along the bottom was "The Beef People." Winn-Dixie logo, 1980s through mid 2000s. Regrettably, Winn-Dixie has been going through some financial challenges, and have been closing many stores and exiting some markets. I worry that one of these days WINN-DIXIE will be more remembered as the name of a dog than for an iconic Deep South grocery company. More about Winn-Dixie today may be found on their corporate website.